You would be hard-pressed to find another 6-10 team in recent memory with as much positivity surrounding them as the San Francisco 49ers have this offseason. Despite the losing record, it’s difficult to look at Year 1 of the John Lynch-Kyle Shanahan era as anything but a success for the previously floundering franchise. ‘Lynchahan’ pressed the reset button on a roster that had become devoid of talent in the post-Jim Harbaugh years, adding a number of quality contributors in both free agency and the draft. That alone would’ve been enough to clear any reasonable expectation for the first year of a rebuild, but of course that wasn’t all. The 49ers also landed a franchise quarterback, with Jimmy Garoppolo falling into their lap via a mid-season trade that feels borderline illegal in hindsight. Five consecutive wins later, including 44-point outburst against the league’s best defense, and here we are. With their signal-caller of the future locked up to the NFL’s richest contract (for now), San Francisco’s perceived timeline to compete for a playoff spot (and more) has been accelerated, despite several holes still present on the roster. Even with Garoppolo’s massive cap hit in 2018, the 49ers still have the league’s fifth-most cap space, putting them in a position to be “aggressively prudent” in pursuing players at the top of the free-agent market they deem to be worth the cash. Other names will garner more attention. Eric Reid is the 49ers’ most talented pending free agent, but a more-than-capable replacement is already on the roster in Jaquiski Tartt (85.8 overall grade), a former second-round pick still on his rookie deal. Carlos Hyde has always been an above-average runner, but contributes little value in the passing game, evidenced by his receiving (34.9) and pass-blocking (28.3) grades that both ranked dead last among qualifying running backs in 2017, making it tough to justify handing him a sizeable second contract. That leaves Fusco, an underrated 2017 free agent signing who put together a solid campaign in San Francisco (76.0) last season. Like many members of the 49ers’ offense, Fusco was better over the second half of the season, particularly in pass protection where he allowed just eight quarterback pressures over his final eight games after allowing 21 through his first eight. Admittedly, it’s unlikely San Francisco views Fusco as a long-term solution — he’s still a bit inconsistent from week to week and has issues with top competition. However, without a clear difference-maker among San Francisco’s pending free agent class, retaining their top guard, a position in need of all the capable bodies they can find, is an easy win. San Francisco has desperate need of talent at the cornerback position. With slim free agent options at other premium positions of need, it’s also the position that makes most sense for the 49ers to splurge on a top-of-the-market player. Bizarre Super Bowl benching aside, no other cornerback expected to be available in this year’s crop of free agents has the multi-season track record of quality play that Butler brings to the table. Even after something of a down year in 2017, Butler has earned an overall grade of 79.2 or higher in all three seasons as a starter and is just one year removed from top-10 play (88.1 overall grade in 2016, seventh overall). Butler excels in man coverage and has experience tracking top wideouts all over the field, but has shown the ability to make plays in all coverage types throughout his time in New England’s multiple defensive scheme. 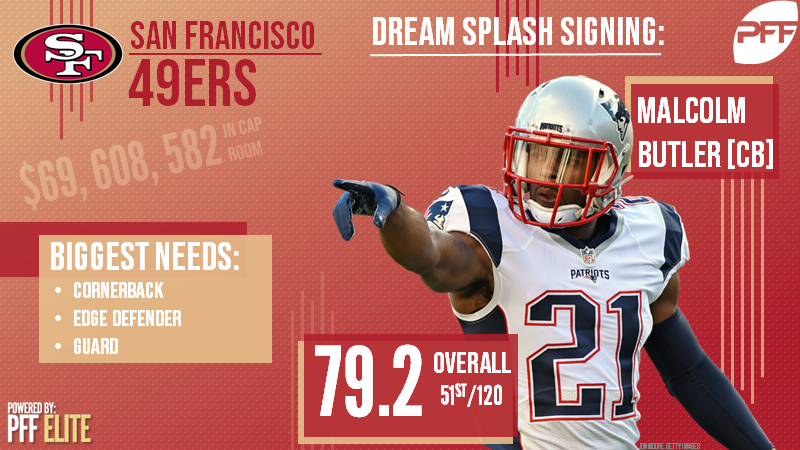 Butler’s playmaking ability would be a welcome addition to a 49ers secondary that has struggled to produce positive plays on the back-end in recent years. Over the past three seasons, Butler’s top notch ball skills have led to 44 plays on the ball (eight interceptions, 36 passes defensed) on 285 passes into his coverage, trailing only Marcus Peters (50) among cornerbacks. During that same span, 49ers cornerbacks have combined to produce just 68 plays on the ball across 768 targets, the second-lowest total of any team. Butler isn’t without his warts — he’ll give up some big plays due to his aggressiveness going after the ball and lack of elite speed — but the 49ers are unlikely to find another player this offseason capable of upgrading their pass coverage to the same extent as the former Super Bowl hero. Sitton, who enters the open market after the Bears declined to pick up his option for 2018, provides the 49ers with another option at the top of the guard market should Andrew Norwell prove too rich for their liking (or unavailable due to a franchise tag). Interior offensive line has been a problem spot in San Francisco for years, and while they could also look to a deep draft class here, Sitton would be an immense upgrade at the position. During his time with the Packers and Bears, Sitton has been one of the league’s best pass-protecting guards, earning a top-five pass-block grade in all but two of his nine seasons as a full-time starter. Since 2009, only 2.2 percent of Sitton’s pass-block snaps, or one in every 46, have resulted in a quarterback pressure, the lowest rate among guards with at least 1000 pass-block snaps in that span. If you’re going to spend big money on a guard in today’s NFL, they better be able to pass protect and Sitton unquestionably fits that bill. The free agent cupboard is bare when it comes edge rusher, particularly with DeMarcus Lawrence and Ezekiel Ansah off the market. Of the remaining options, Galette is perhaps the player most poised to make an immediate impact for his new team. After suffering Achilles tears in both 2015 and 2016, Galette bounced back admirably in 2017 in a part-time role as a designated pass-rusher, recording 37 quarterback pressures on just 241 pass-rush snaps to produce an 11.9 pass-rush productivity that ranked 15th among qualifying edge defenders. As an undersized player, Galette possesses the speed you’d expect off the edge, but also has the inside counter to put tackles in a bind on the outside. John Lynch will ultimately need to decide whether Galette possesses the requisite “football character” to overcome a checkered past off the field, a decision undoubtedly complicated by Reuben Foster’s multiple arrests this offseason. On the field, however, it’s clear Galette brings the speed element off the edge San Francisco needs to pair with their glut of interior rushers. It would be surprising if the 49ers failed to add additional weapons this offseason to flank Jimmy GQ with. However, as is the case with edge defenders, there aren’t many free agents at wide receiver or tight end that teams should be rushing out to pay top dollar for, particularly if top options like Allen Robinson are tagged. Alternatively, it’s no secret Shanahan likes to get running backs involved in the passing game — Hyde finished the year with 83 targets, fifth-most among running backs and 21 more than he managed to accumulate during his first three seasons combined — and it’s there where he may find a free agent pass-catcher to upgrade his aerial attack. Only three qualifying running backs managed to earn receiving and pass-block grades of 75.0 or higher last season: Dion Lewis, McKinnon and Devontae Booker. Lewis, also a free agent, could just as easily be listed here depending on how NFL teams value his skill set. However, spending significant money at running back is rarely wise and it seems more likely McKinnon won’t command as hefty of a paycheck. McKinnon, whose 82.4 receiving grade ranked seventh among running backs in 2017, has the sort of top-end athleticism and elusiveness that makes him dangerous in the open field. He would immediately upgrade San Francisco’s screen game and provide Garoppolo with an option capable of turning routine checkdowns into first downs.